Let's face it, we've all been in that uncomfortable position where you're not sure how much is appropriate to tip at the salon. Is there an app for this?! Proper tipping etiquette at the salon isn't the same as tipping at a restaurant or tipping your taxi driver, there are several key tips (no pun intended) to remember! We took a look at several beauty services including haircuts, manicures, skin care and spa services and determined based on industry standards and our own editor's experiences. Click through the gallery below to find out a few pointers you may have never considered! Tipping should be based on your comfort level. If you are getting your hair done for the first time by someone new, tipping 15% is absolutely ok. If you've developed a relationship with your hairstylists, we suggest you tip at least 20%, even 25%. While it may seem like too much, your hairstylist spends 1-2 hrs on your hair, they deserve a proper thank you! While you may be focused on tipping your hairstylist, don't forget to give a few dollars to the other stylists who helped. If you had someone wash your hair that's different than your stylist, you should always give them $4-6 as a thank you. They helped make you look beautiful! Some salons will offer a free bang trim or complimentary trim that accompanies their original service. If this is the case, make sure you tip a little. They are giving you a free service (and let's face it, nothing is free) so by thanking them for going above and beyond is key. Whether you are at the most high-end salon or the local nail salon down the street, you should always tip 15-20%. Consider the treatment you are getting done as well. 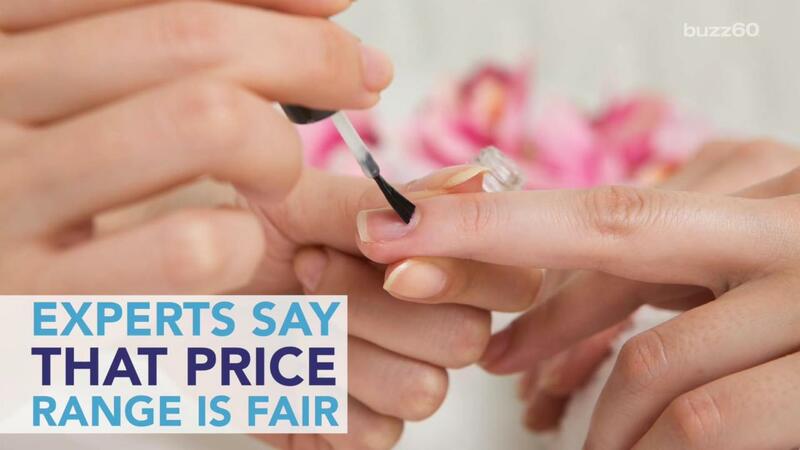 If you are opting for gel manicures, we suggest you tip more (around 25%). The longer and more detailed manicure deserves a bigger tip. Tipping on your pedicure is similar to tipping on your manicure but we suggest tipping a little more on this service. If you are getting a pedicure tip roughly 22%. If you are getting a discounted manicure/pedicure combo, we suggest you tip 25%. Just because it's discounted doesn't mean you should tip less! Prices for a spa services vary a lot between smaller services like a wax to more in-depth services like a massage or a facial. We suggest you tip at least 25% for most services. Of course, if you aren't happy with the service, tip less, but even small services take time. Get off your phones! If you're in the midst of a service, we suggest you keep your phone away. Not only should you enjoy your service but for the stylist there is nothing worse. Many have expressed concern that someone on their phone is a recipe for a haircut disaster. BRING CASH! Most salons will not accept tips via credit cards or debit cards which means you'll need to bring cash for tip. Save yourself a unneccesary trip to the grocery store for cash and bring it with you.